RANLife Home Loans, a nationwide mortgage lender is celebrating their 10th year as a Better Business Bureau accredited business. Since 2003, RANLife has maintained an A+ standing and they look forward to continuing their accreditation for future years to come. 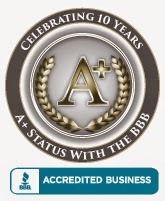 The BBB accepts businesses that meet accreditation standards and has determined that RANLife meets these requirements. These requirements are built on the BBB Standards for Trust, which summarizes important elements of creating and maintaining trust in business. All companies are monitored and must continue to demonstrate their commitment to retaining and creating trust. Unlike other private mortgage lenders, RANLife offers a wide variety of loan programs to fit every home buyer’s goals and needs. Users can go on their website where they can easily compare mortgage options to find the best and most affordable home loan. RANLife offers lending through FHA, VA, USDA and Conventional Loans as well as all types of refinances including streamlines, cash-out, and rate and term. RANLife also provides one of the fastest loan turn times in the nation. Many of their clients choose RANLife over other lenders because of their ability to close loans three times faster than the competition. On top of fast and superior service they also offer low rates and closing costs. RANLife wants to recognize their past and current clients that have put their trust and loyalty into the company over the years. “If it weren’t for our amazing clientele RANLife wouldn’t be where we are today,” commented Tarshis. RANLife looks forward to continue working with the BBB to provide the best possible experience to every client buying or refinancing their home. And stay up to date on the Home Lending Life blog at http://blog.ranlife.com.